Anytime anywhere mobile learning is shifting modern education into more inclusive and higher quality personalized learning experience. But even the most informative and beautifully designed mLearning courses can fall short if they lack the component of knowledge retention. The ultimate goal of any mLearning deliverable is to create memorable and powerful content, which is easy to remember, and difficult to forget: make it stick! 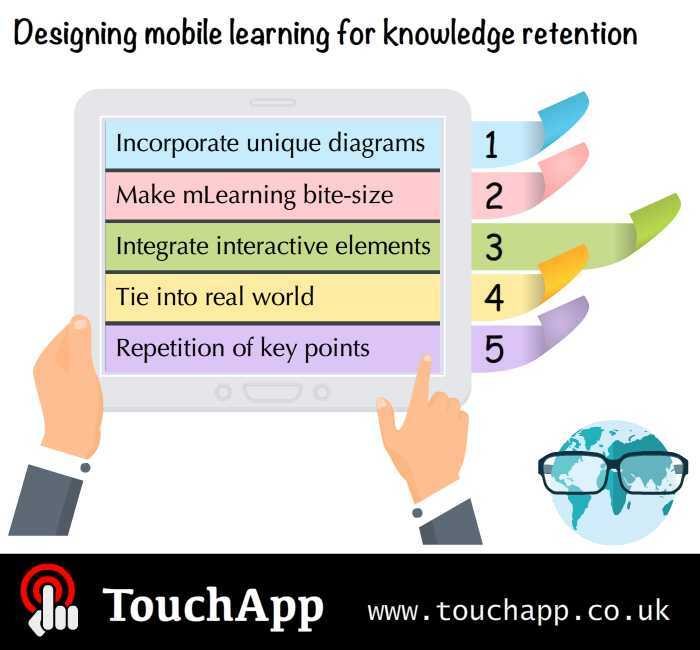 Here we highlight some key aspects to conquer the challenge of knowledge retention in the area of mLearning design. Visualization adds dimension and impact to mLearning content and it is a tried-and-tested learning strategy to improve comprehension, retention, and restoration in learners. Visualized elements like charts, graphs, and diagrams can help learners to understand relationships, identify patterns, and spot trends without going through long chunks of texts. We remember pictures more easily than words, and the novelty and uniqueness will further boost the potential of the imagery. As mLearning designers, you should try to wrap information around unique and unusual visuals, such as infographics, unconventional images, or distinctive layouts etc. Thus your learners will retain the element of surprise and remember the unexpected stimuli more easily. Cognitive overload is the enemy of knowledge retention; therefore, you want to avoid dumping too much content at once. In order to offer digestible mLearning course effectively, you need to chunk the content and create short, succinct bite-sized modules. When you compress text blocks and build logical associations between modules, learners have the chance to absorb critical information of each chunk more effectively and then move forward to the next one. This will help to prevent cognitive overload and build up long-term memory more productively. To provide truly immersive mLearning experience, you need to fully engage the learners and use interactive elements and activities to retain students’ attention and boost knowledge retention. Multimedia options such as audio, video and animations, can appeal to different audience and aid the process of knowledge acquisition. Innovative teaching activities such as gamification, storytelling and quizzes, can stimulate learners’ interests and foster a motivational emotional connections between users and content. This will help students to create memorable associations of the subjects and commit the relevant and relatable content firmly to the memory. MLearning offers learners true value only when it connects with real life problems or situations outside of the virtual learning environment. As such, you can embed role-play exercises, simulations, and scenarios to provide users the opportunity to participate in real world applications of the subject. This will help learners to recognize the practical purpose of the learning concepts and by executing the real life tasks, students make meaningful connections of the content to allow their brains to retain knowledge and skills for much longer. Repetition reinforces the learning process and strengthens the connections between neurons to aid memorization. As a mLearning course designer, you can use creative methods to repeat essential key points throughout the course. For example, once the information has been listed as bullet text, try to represent it with a diagram or include it within a scenario. You can also introduce an avatar or narrator into your mLearning modules to guide learners to key pieces of information or provoke relevant questions to retain what they’ve just learned.